At GreenWorks, we strongly believe that sustainable designs can also be beautiful. This idea is wonderfully demonstrated in the recently published book Artful Rainwater Design: Creative Ways to Manage Stormwater by Stuart Echols and Eliza Pennypacker. According to the book’s description, “this beautifully illustrated, comprehensive guide explains how to design creative, yet practical, landscapes that treat on-site stormwater management as an opportunity to enhance site design.” GreenWorks’ Washougal Town Square is featured as a case study in this “must-have resource for landscape architects, urban designers, civil engineers, and architects who won't let stormwater regulations cramp their style, and who understand that for a design to truly be sustainable, people must appreciate and love it.” Other GreenWorks projects such as Headwaters at Tryon Creek and RiverEast Center are also included in the book. Sustainability in educational facilities has been building movement in schools across the Pacific Northwest over the past decade. Several design firms including GreenWorks have been working toward integrating sustainability in schools not only to set an example of high environmental standards but to serve as a teaching tool for students to learn the value of sustainable thinking. A recent DJC article highlights this trend with several schools in Oregon and Washington, including Da Vinci Arts Middle School, for which GreenWorks designed the site work for a modular 21st century classroom that serves as a study model for the school district. GreenWorks continues to work with Science teacher Jason Hieggeokein creating a tree sink project on site. The project will demonstrate the carbon sinking effects of trees in an artistic and inviting way. Inviting the students to explore nature further. That is what science teacher Jason Hieggeoke has been doing at Da Vinci Arts Middle School. 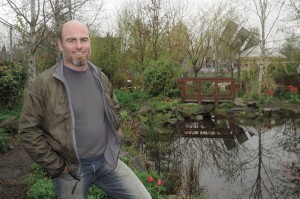 He has used a water garden, which drains storm water, as a living laboratory. GreenWorks has worked with a number of teachers and classrooms across Oregon to help incorporate learning landscapes into their schools. Projects include stormwater, gardens, native restoration, outdoor classrooms and natural play areas. If your school is heading in this direction and looking for a little design guidance we would love to hear from you.